Winter is really hard on your skin. The combination of cold, dry winds and dry indoor furnace air can leave you scratching yourself all over. 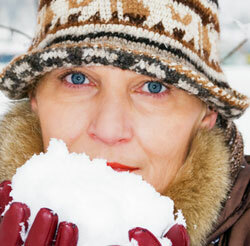 However, there are things you can do to make your winter skin look and feel better. First, invest in a humidifier. You can add a whole-house humidifier to your furnace, and you also can buy a room humidifier for your bedroom or any other room where you spend a lot of time. A humidifier can replace some of the moisture that your furnace takes out of the air – and out of your skin. Similarly, make sure you drink enough water. Hydrating your body can help hydrate your skin. Dress for the weather. When it is cold outside, cover up. Wear gloves, and wrap a scarf around your face. This can help keep biting winds from taking a bite out of your skin. Take short, cool showers rather than long, hot baths. Hot water only dries out your skin – more so the longer you sit in it. Replace your regular soap with a gentler, moisturizing soap or shower gel. And remember that you don’t have to take a bath every day if you are not dirty. Lotions. Lotions have a higher water content; they pour from a bottle. They are easy to apply and absorb quickly. They are best if your skin is only mildly dry. Creams have less water than lotions. Usually they do not pour out; you have to dip your fingers into them to apply them. They are stickier on your skin, and they don’t absorb as quickly. However, they do provide more moisturizing, which makes them a good choice if you have very dry skin. You probably want to use a different cream or lotion on your face than you use on your body. The cream or lotion you use on your face should have sunscreen if you are going to be outside. You also can get facial creams or lotions that have ingredients to fight wrinkles and other signs of aging. You also might want to use a different cream on your hands; like your face, they bear the brunt of exposure to the cold and wind. Also, you probably wash your hands more during the winter to avoid germs, which can dry your hands even more. It might make sense to keep a tube of hand cream in your desk drawer or purse so you can apply it regularly throughout the day. Don’t forget about your lips, which can get very dry and chapped in the winter. Regularly use a lip balm. If you are going to be outside a lot – if you are skiing or showshoeing, for example – get a lip balm with sunscreen. Sometimes the itching from dry skin can cause you to scratch until you break the skin, leaving it open to infection. If your skin is very, very dry or if you develop a rash or infection, see your doctor.